Protecting core educational instruction in small class environments At Lakeside, all of our teachers and instructional aides exceed the “Highly Qualified” designation set by the state. The average number of students per class at Lakeside is 17.8. In addition to the teacher, each class has an instructional aide to support small group and individual academic instruction. Our staff received professional development in Project Based Learning, Art Inspiration and Educational Technology. These teacher training’s translate to increased opportunities for our students to learn in a more collaborative, student centered creative environment while developing their critical thinking and communication skills. Through private corporate grants and donations from the Lakeside Community Foundation, the community continues to invest in the future by helping to provide the technological tools necessary to prepare our children for their future as successful students and contributing citizens. Continuing to provide a comprehensive education for middle school students. Lakeside has developed a partnership with the Campbell Union School District and the Loma Prieta Joint Union School District whereby our sixth through eighth grade students currently attend middle school at either Rolling Hills or C. T. English. Lakeside families are able to select from these two highly rated, exceptional programs finding the best fit for their students and giving Lakeside students the opportunity to experience a robust middle school curriculum and environment. Continuing to provide exceptional enrichment programs. With the additional help of Lakeside Community Foundation and Lakeside PTA, Lakeside students receive supplemental enrichment programs including Orff Music, Theatre and Dance. Additionally, each child receives Physical Education twice a week from a P.E. Specialist. These valuable programs help provide a well-balanced curriculum that will continue to benefit the students through their educational journey beyond the Lakeside campus. Fiscal Accountability The District’s finances are well-managed with a General Fund budget of approximately 1.6 million dollars. The partnership between the Board and Lakeside teachers helps maintain a trusting, caring environment that focuses on the needs of students first. Skilled educators, a dedicated Board, and a supportive community are cornerstones to a solid foundation at Lakeside. The Measure C independent citizen’s oversight committee has reported that all funds have been spent as promised. The Lakeside School District has been open and transparent about our voter-approved spending. Thank you to our local community for supporting Measure A! 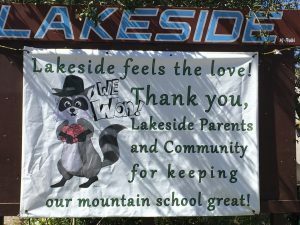 On March 7, 2017 Measure A passed with 71.7% of the vote, allowing Lakeside to continue to provide an excellent education to the students of the Lakeside Joint School District!